25.0" x 17.5" stitched on 14 count. 19.4" x 13.6" stitched on 18 count. 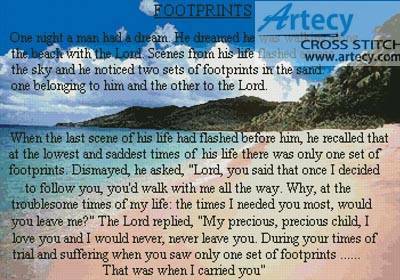 Footprints 2 cross stitch pattern... This counted cross stitch pattern was designed by incorporating the popular footprints verse over a realistic beach scene. Only full cross stitches are used in this pattern.